"Is the largest particle collider in the world. In a ring 27 km in circumference, buried about 100 m underground, bunches of electrons and positrons (antielectrons) race round in opposite directions as they are accelerated to almost the speed of light." From *The Large Electron Positron Collider* . "Particle collider" is an accelerator configuration in which particles and/or anti- particles collide head-on. Provides the most efficient mechanism for translating beam energy into collision energy. 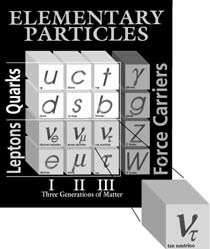 "At the end of eleven years of running, LEP will be remembered as the machine that put the theory describing particle behaviour - the Standard Model - on solid ground. Precision measurements made by the four LEP experiments have confirmed the Standard Model to an extraordinary degree of precision. They have also demonstrated conclusively that three and only three families of matter particles exist." From *LEP shuts down after eleven years of forefront research*. Last experiment was the hunt for the *Higgs boson*, the theoretical particle related to the mechanism thought to be responsible for giving masses to all other particles. The Higgs (named after theorist Peter Higgs) is the last undiscovered particle predicted by the Standard Model. Higgs, or something like it, must exist because otherwise nothing would have any mass. Mass keeps things still, determines the range of forces and sets the scale of all the structures we see in nature. Without mass, the cosmos would be a chaotic soup of particles zipping about at the speed of light. "LEP's experimental collaborations range in size from some 300 to over 700 physicists from institutes around the world. This is collaboration on an unprecedented scale could only work through first class communication and it was this need that was the catalyst for the invention of the World Wide Web at CERN." From *CERN celebrates LEP*. Physicist Tim Berners-Lee, "with a background of system design in real-time communications and text processing software development, in 1989 invented the World Wide Web, an internet-based hypermedia initiative for global information sharing while working at CERN. He wrote the first web client (browser-editor) and server in 1990." From *Tim Berners-Lee*. Left CERN in 1994 for the Massachusetts Institute of Technology's Laboratory for Computer Science. Since then, he's directed the World Wide Web Consortium (W3C), the organization charged with maintaining open standards for the Web. "We, the Participating Countries, recognize the outstanding scientific achievements of LEP that have illuminated the family structure of fundamental particles and the texture of our universe. "LEP achievements open the way for a new challenge, the Large Hadron Collider (LHC), which will allow us to go deeper in the exploration of the structure of matter, space and time. (...)" From LEP commemorative plaque. LEP's successor, the *Large Hadron Collider (LHC)*, will come on stream in 2005. These are the measurements taken of LEP's final beam. The accelerator was switched off for the last time at 8:00 am on 2 November.